The Adelaide Casino is one of the city’s biggest tourist attractions, located next door to the heritage listed Adelaide Railway Station and sitting on the banks of the gorgeous River Torrens. Adelaide’s best hotels, bars, restaurants and festival facilities are all within close walking distance, making the casino a must for any visitor to the city whether to throw some money in the pokies, try your luck at the roulette table or just enjoy a drink from one of several exquisite bars. The Adelaide Casino has a relatively humble history, first opening its doors in December 1985 with a license from the state owned Lotteries Commission. The casino featured 89 gaming tables before the 90’s when video gaming machines and eventually pokies were introduced and by 1995 the casino had earned a huge $20.20 million for the South Australian government. In June 2000, the Adelaide Casino was sold to the SkyCity Entertainment Group and officially renamed SkyCity Adelaide in 2001. The SkyCity Group was approved for a 15 year exclusivity license, making the casino the only place in the state allowed to run table games. Major renovations started in 2003, redeveloping the casino interior and in 2009 the casino reverted to be named the Adelaide Casino despite still being owned by SkyCity. The casino license was renegotiated in 2013 and SkyCity’s license was extended by 20 years, giving the group a monopoly on table games until 2035 and increasing the casino’s capacity to 200 table games and 1,500 gaming machines. The casino is now the 10th largest employer in South Australia, employing over 1000 staff and injecting around $30 million to the state government each year. From 2014 onwards, the casino has received major multi-million dollar refurbishments including the addition of several new rooms and award winning restaurants. What games are available at Adelaide Casino? Adelaide Casino’s gaming facilities are spread over three floors and include gaming machines, table games, VIP rooms, TAB and sports betting facilities. Gaming machines – the Adelaide Casino has more gaming machines than any other venue in the state, with something to suit all tastes and bankrolls. 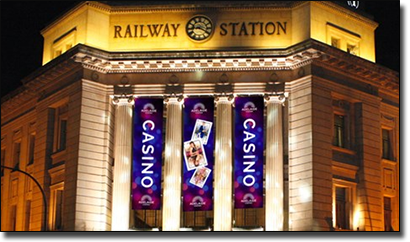 Not just limited to pokies, the casino has other electronic games like Rapid Roulette and Rapid Baccarat. The selection includes several progressive jackpot pokie machines, some extending into the hundreds of thousands of dollars. The recent addition of The Barossa Room provides an exclusive gaming space with 190 new machines, priority service and full bar and cafe services, open to members and their guests only. Table games – punters have plenty of choice when it comes to table games at the Adelaide Casino, including baccarat, Big Wheel, blackjack, Caribbean Stud poker, Casino War, Texas Hold’em poker, sic bo and roulette. The table games are all hosted in sophisticated, elegant casino settings with drink facilities never far away. TAB and sports betting – you can place TAB and sports bets in the comfortable setting of the Grandstand Bar, with the Sky Channel displayed over various screens and terminals, with seven information touch screens to give you details on upcoming games. VIP gaming – there are several exclusive facilities available for valued VIP guests, including the exquisite Grange Room and the Platinum and Black electronic gaming rooms. The Grange Room features a range of table games along with private gaming rooms, massage chairs, plasma screens, private outdoor area, full bar and business centre with computers and printers. The VIP electronic gaming rooms have premium gaming facilities, private spaces, complimentary food and beverages and access to exclusive promotions. VIP’s receive dedicated treatment from professional VIP hosts. For a break between games, a refreshing beverage or a delicious meal, the Adelaide Casino has plenty of great facilities on offer. Restaurants – after major renovations in 2014, the Adelaide Casino has become a hot spot for world class dining, attracting locals and visitors alike. World renowned chef Sean Connolly opened the New York Brasserie insired Sean’s Kitchen which uses South Australia’s finest produce, followed by internationally acclaimed chef Nic Watt who opened the exotic French-Vietnamese espresso bar and bistro, Madame Hanoi. If you’re looking for something on the casual side, Cafe Junction provides a relaxed setting for a quick snack, counter meal or deli food and even provides take away sandwiches and baguettes. Bars – there are several bars to choose from, one to suit all tastes. The Chandelier Bar is great for a relaxed wine, POP is the place to be for delicious cocktails and an extensive champagne menu and the Grandstand Bar has you covered for all your sporting needs. If the outdoors is more your thing, there’s two trendy outdoor bars, The Oasis Outdoor Bar and the Backyard Bar. The Premiere Rewards program is open to all visitors to the Adelaide Casino, you just need to sign up at the Premiere Rewards desk or can even register online beforehand. It’s free to join and you can start earning points right away. Members receive a range of special benefits including EZYPlay cashless gaming, higher bet limits, bigger jackpots, free parking, exclusive food and beverage offers, discounts on merchandise and invitations to members-only promotions and events.